I did two new things last weekend...I sailed on a river and knitted on a sail boat. Not too many folks can say they did that over the weekend! There just was no time to knit in Grand Rapids at Convergence so I took my little scarf up to Sonoma for a little vacation. We all went sailing on the Napa River - quite fun...a bit warm...at times very warm...Fortunately my scarf is made of a light cotton and modal blend so knitting in the heat was not too much of an issue. I got six to eight inches done and even changed the yarn color! While in Sonoma I also had the time to visit the Sonoma Valley Museum of Art which had a textile exhibit of Jack Lenor Larsen; creator & collector. To know more about him & the exhibit read the article from the Press Democrat...click here. The exhibit was fabulous. It was like being back at the Great Lengths Yardage Exhibit at the Gerald Ford Presidential Museum in Grand Rapids. There were many different weave structures on display plus they had a touching gallery. The yardage was hung well from the ceilings. There was one piece which had a lovely front and back that hung over three sets of pipes hanging from the ceiling so viewing both sides was quite easy. The exhibit goes through August 20th so if you are in Sonoma make sure to go! 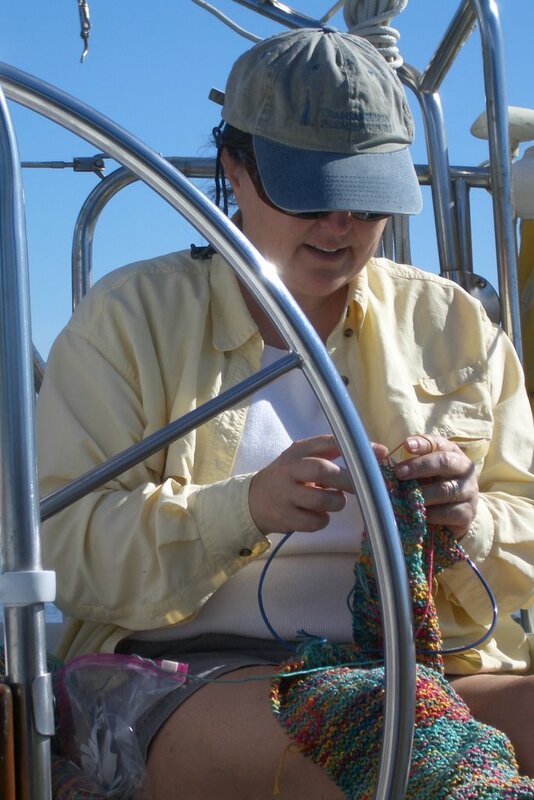 Yep--knitting on a sailboat is pretty exciting!